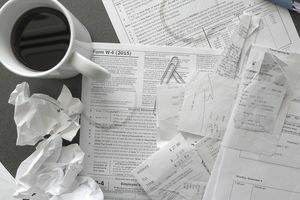 If you complete your tax return only to realize that you owe the IRS money, you can take some small comfort in knowing that you're not the first person to find himself in this predicament. Yes, it can be particularly stressful if you've never owed the IRS before or if you just don't have the available cash to make a lump sum payment. The Internal Revenue Service has dealt with this dilemma many times before, however, so it offers some options and grace periods. First, figure out how quickly you can pay off the tax debt. Paying the debt all at once will save you some money if you have the cash on hand or you can get it—the IRS will continue to assess late payment penalties up through the date you pay in full. If that's not possible, however, the IRS will let you pay the debt over time. The downside to this is that interest and late charges will continue to accrue until it's paid off. If you can't pay your tax bill in its entirety right now but you know that you'll be able to do so within 45 days, send in a partial payment using the Form 1040-V payment voucher at the time you file your return. Most tax preparation software provides the form and it's also available online at the IRS website. Wait for the IRS to send you a letter detailing your outstanding balance and any late charges that have been added. The IRS usually provides a grace period for payment of between 30 to 45 days after sending that letter. Pay your remaining balance by the deadline set by the IRS. The process is similar if you can pay within four months. Send in a partial payment using Form 1040-V and wait for the IRS to send you a letter telling you how much you owe including late charges. Then call the IRS at the number shown on the letter to request a short-term extension of time to pay beyond the date set in the letter. Propose a definite deadline for paying off your balance in full and the IRS will note that date in its records. Use the payment voucher that's included with the letter to make your next and final payment. Calling the IRS is important with this payment tactic because it will prevent the government from taking more aggressive collection actions. You're letting the IRS know that you're on top of the situation and you're trying to fix it. The IRS will usually let you set up a monthly payment plan, also called an installment agreement, if you're going to need a more significant amount of time to pay off your tax debt. This is a formal agreement to pay the IRS over time and the IRS will likely approve your payment plan as long as it will pay off your tax debt in three years or less. Depending on how much you owe, you might also have to submit a financial statement. This is generally required if you owe more than $10,000 but streamlined installment agreement applications are available for taxpayers who owe up to $25,000. The IRS does charge a fee to set up these plans. It ranges from $43 for low-income taxpayers up to $225 as of 2018. This is a one-time fee that's paid up front and it's typically included with your first payment. You can apply for an installment agreement online at the IRS website if you owe $50,000 or less. This option doesn't come with a set date by which you'll pay off the IRS and it's available only if the IRS agrees that collecting from you at this point in time would present an undue financial hardship to you. Your tax debt doesn't go away. It's put on hold until such time as your finances recover. You must be able to prove that if you were to pay the debt, you would not be able to meet your necessary living expenses. The IRS will file your matter as "currently not collectible" but penalties and interest will continue to accrue. The IRS is effectively agreeing not to aggressively pursue you for the money by way of levies and other collection avenues available to them. If you can't afford to pay your taxes at all, your best bet is to seek professional advice from a tax professional who's authorized to represent you before the IRS. This typically includes CPAs, attorneys, and enrolled agents. Many tax clinics provide free or low-cost access to tax professionals and that's generally a good place to start if you need help. A competent tax professional can evaluate your options, such as requesting a temporary delay, setting up a partial payment plan, or negotiating a settlement through the offer in compromise program. The IRS isn't really as heartless as its reputation would make it out to be. It also offers a Taxpayer Advocate Service for assistance in this and other unpleasant situations. The worst thing you can do if you owe the IRS money is nothing. It typically welcomes all overtures to get tax debts paid and it might even accept less than what you owe if your financial situation qualifies.